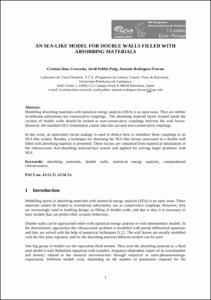 Díaz-Cereceda, C.; Poblet-Puig, J.; Rodriguez-Ferran, A.
Modelling absorbing materials with statistical energy analysis (SEA) is an open issue. They are neither reverberant subsystems nor conservative couplings. The absorbing material layers located inside the cavities of double walls should be treated as non-conservative couplings between the wall leaves. However, the standard SEA formulation cannot take into account non-conservative couplings. In this work, an equivalent circuit analogy is used to deduce how to introduce these couplings in an SEA-like system. Besides, a technique for obtaining the SEA-like factors associated to a double wall filled with absorbing material is presented. These factors are computed from numerical simulations of the vibroacoustic leaf-absorbing material-leaf system and applied for solving larger problems with SEA. Díaz-Cereceda, C.; Poblet-Puig, J.; Rodríguez, A. An SEA-like model for double walls filled with absorbing materials. A: Congreso Ibero-americano de Acústica. "VIII Congresso Ibero-americano de Acústica: ACÚSTICA 2012, 1-3 outubro, Évora-Portugal". Evora: 2012, p. 127.